The Emma & Chloe subscription is nicely packaged in a well-made box. The interior is printed with illustrated French landmarks and jewelry pieces. The jewelry item was neatly packaged inside a black drawstring bag. This subscription also comes with a short magazine that tells you more about the jewelry selected for this month along with a profile on the designer. I love that this necklace is one curved metal piece – it’s so unique looking! 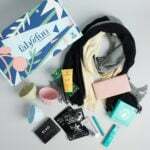 Verdict: I think this is a fab jewelry subscription! It’s quality over quantity, and this piece is definitely impressive, and something I feel good paying $35 for. Plus I love that I can always get gold pieces – I think that really helps cut out the risk of this subscription. And the packaging and presentation of this subscription box are amazing. This definitely qualifies as a gift to yourself – it was so fun to unbox! I ordered in November when MSA posted the spoiler. I have now been charged for November and December and have not received any items or shipping notices. Has anyone else had issues with this company? I have reached out to customer service but my questions have not been answered. Steph M — was this issue ever resolved for you? If not, I would like to get your contact info so I can get this straightened out for you. We are so sorry about this and want to make good on this for you! Please let me know how best to reach you. I love the look of this necklace. If I were to subscribe today, would I get this box? Or would it be a future one? Do you know? I received this necklace, my first box of the sub and have to say I didn’t care for it. Granted the more I looked at it the more I liked it but it was way too short for me so up for swap it went. I also will add that it seemed decent quality, much better than some pieces I have been sent from other subs. It did swap pretty fast at least and since I got the 60% off my first box deal it wasn’t a bad investment. I will continue to check out this sub and maybe in the future there will be a piece that I can actually use. I know you already swapped yours but have you ever tried chain extenders? They’re a godsend!